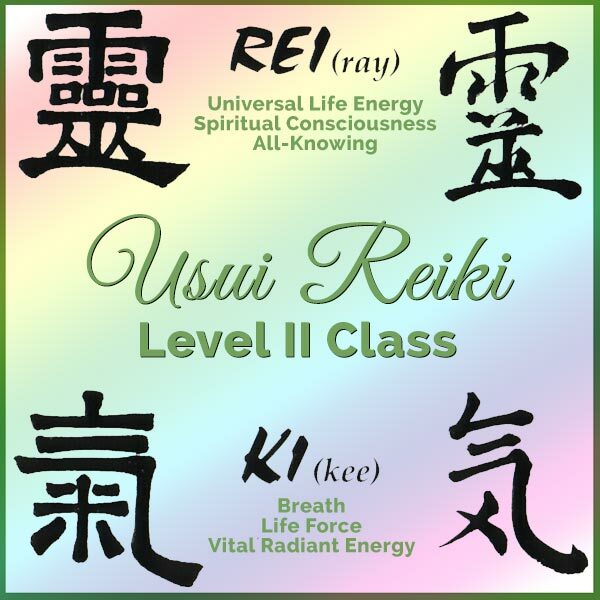 In the second degree Reiki course the student learns the use of a number of symbols that are said to enhance the strength and distance over which Reiki can be exerted. You must already be a Level I Reiki Practitioner to take this class. I usually hold Reiki classes on Saturdays but can accommodate other days and times. After ordering I will contact you to set up your personal class time. Most Reiki classes are one on one, individualized instruction. See complete course details below. If you are signing up for the March 30th class held at Natural Balance Yoga & Wellness in Harvard, please add a note to your order. This course teaches you the use of a number of symbols that are said to enhance the strength and distance over which Reiki can be exerted. The symbols form a temporary connection between the practitioner and the recipient, regardless of location and time. An attunement is given, which is said to further increase the capacity for Reiki to flow through the student, as well as empowering the use of the symbols. Having completed the second level, the student can work without being physically present with the recipient - a practice known as "distant healing". Class cost includes instruction, a guided meditation, symbols, a manual, your attunement and completion certificate. We will also practice using the symbols. Plan on an approximate 3 to 4 hour class time.